Blender is currently at version 2.79a. 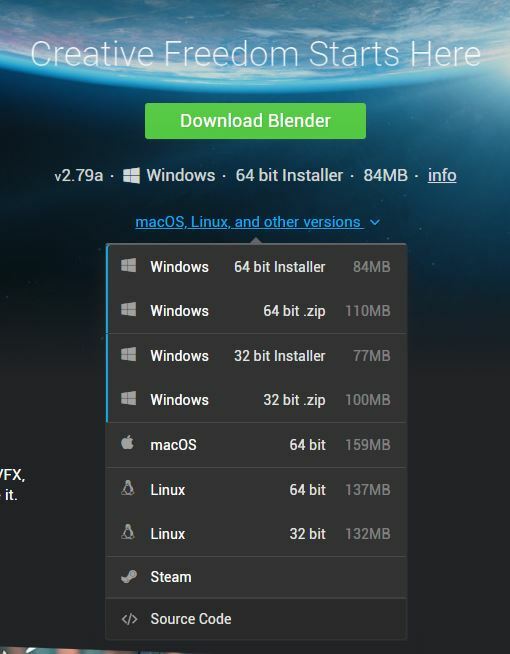 The Blender download is here. The Portable version is the version I use so I can have multiple versions installed. I’ll explain why later. Also, Slink Development now has a Discord Server for developers. The link is in the email. Siddean is available 9 to 5 Eastern Australian Time… Australia has 13 time zones… O.O so… divide by 13 then 24 and multiply by… and turn the world around once… and that gives us 4pm to 12AM SLT/PT. Technically, they are 17 to 18 hours ahead of California, depending on Daylight Saving Time. If it is Monday here it is likely Tuesday there. Posted in Blender, Clothes Skins Etc, Fashion, Mesh, Second Life. Tagged Avastar, Slink. There is a Slink update out. I started seeing people talking about it in the Slink, Classy gear for classy babes group. Slink Versions – It is hard to stay current unless you refer to this page: Slink Versions. It provides the version numbers for the latest versions of hands, feet, body, heads, and HUD’s. As of late 3/6 or early 3/7, depending…, there is a new ALMOST release from Slink: Petite Augment Pack. The ‘almost’ means info has leaked, but the item is not yet in the Slink store. As of 3/7 @ 3PM SLT/PT. Talking with Eleanora Newell (AvaStar) and Siddean Munro (Slink) We have come to the conclusion the updater in AvaStar 2RC8 has a bug. It will supposedly be fixed in 2RC9. Fortunately, we don’t have to deal with the bug. Siddean Munro has updated the May 2017 Slink Dev Kit. The May Kit updated to AvaStar 2.0.30. It is now a June 1 Kit updated to 2.0.46, the newest AvaStar. So, just download the Kit again and get the latest version. Also, if you are moving older projects to the new version, Append those objects to the new updated avatar. It is easier, faster, and presents fewer problems than trying to update the rig. Heya, I’ve been chatting with Eleanora and Gaia [AvaStar peeps] about the update process. It’s not entirely unique to my kit. There was some bug with the update process that Gaia says she’s fixed, will be released in the next version of the release candidate, and Eleanora says you need to have the little snowflake enabled on the update tool for the female body, and to uncheck “male” under the appearance sliders on the male body. I found it just easier to add the new rig and attach the bodies to it, than mess around with their update tool. It’s always been problematic. I will be advising anyone who asks to download the latest from my DropBox though, I will try and keep on top of Avastar updates as much as I can. I don’t really know why they lock the bone rotations. 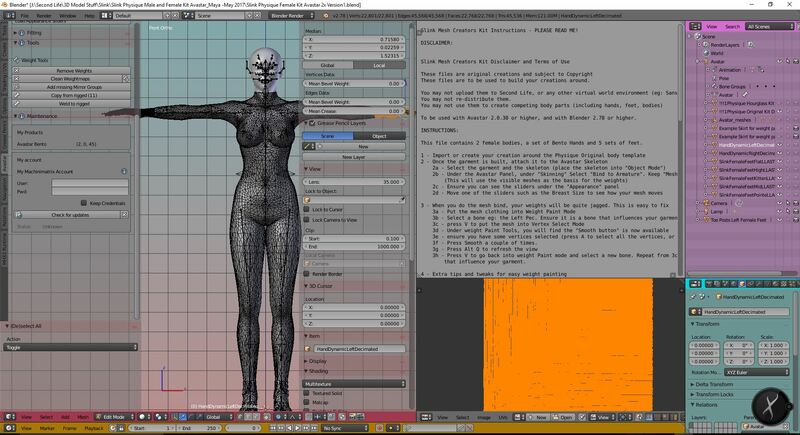 It’s like they have AvaStar all setup for animations, but we have to jump through so many hoops to get the rig ready for creating mesh with it. I’m going to send them a NC with some thoughts today so I will put in a suggestion for a rig setup toggle – animation to skinning maybe. The best thing you can do with your older projects is append them into the new kit, rather than updating the old rig and risking errors from the old body meshes. Eleanora just messaged me that the update tool is broken, the sliders don’t work. So appending to an updated rig might be better in the short term until they figure this out. The rest of the article below is mostly outdated now. However, if you need to update a rig, you may find some help in it. Having some problems with newly released Slink model? I did. Took me some time to figure out how to get it working. This is the ‘step-by-step’ to getting an integrated Slink-AvaStar working base. Siddean Munro has resolved the problem. A new Dev Kit was released 6/1/2017 that is updated to AvaStar 2.0.46. So, save yourself some heartache and get the new file. If you are updating one of your older files, the information in this article may help. As it appears now, the fix is to replace the old rig with a new AvaStar generated rig and avoid trying to update. The model released by Slink is made with AvaStar 2.0.30 (or 2.0-Beta-30). The latest release of AvaStar as I write this is 2RC8 (or 2.0.46). The original Slink file works just fine. Whether you are Skinning and Wight Painting or Animating. Here is the problem I found. The file as received works as I expected. In Blender Weight Paint and Pose Mode, the bones behave as I expect. Once I ran the AvaStar Rig Update, the bones were screwed. Posted in Blender, Clothes Skins Etc, Mesh, Second Life. Tagged Avastar, Slink. I like Slink and I’m playing with making clothes for my Slink Body, attached mesh and applier type clothes. So, I’ve been hoping this update would provide a bit better help for the applier clothes. Nope. This kit is for those making mesh clothes. Posted in Blender, Clothes Skins Etc, Mesh, Second Life. 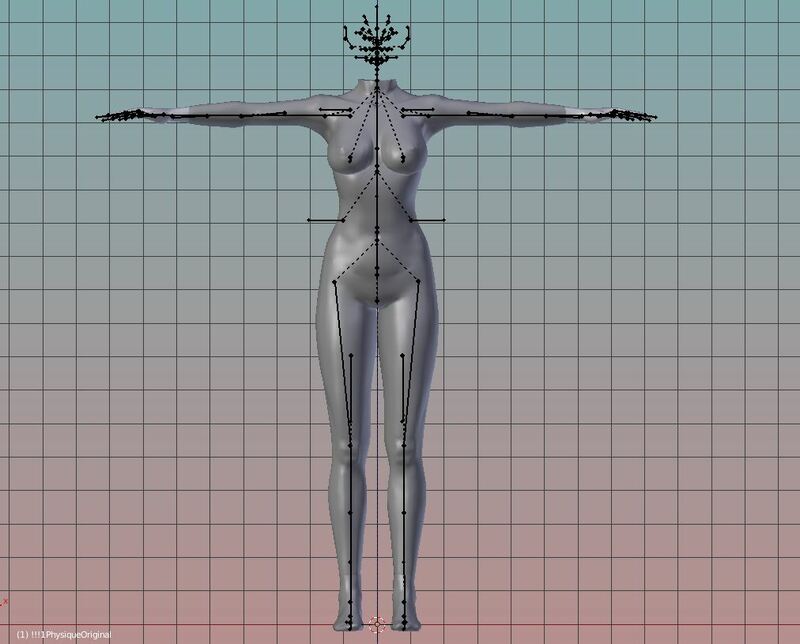 Tagged Clothes, Mesh Body, Slink. Second Life – Slink Update? This video is about how to use AvaStar and the Slink Developer Kit. If you notice the file name in the top menu of Blender you’ll notice is says: …\BentoVersionMarch2017\… My kit is labeled March 2016. So, to me this means an updated kit, which would be great as the current one is a bit of a PITA. Posted in Clothes Skins Etc, Mesh, Second Life. Tagged Slink.